If you’re constructing a new restroom building, it will likely need to be ADA compliant. Conex restroom buildings are no exception. The good news is with a few additional design considerations shipping container bathrooms can be ADA compliant and placed in public spaces like parks and restaurants. Here are a few considerations to be aware of. ADA stands for The Americans with Disabilities Act. This piece of civil rights legislation aims to give people with disabilities equal opportunity to participate in mainstream American life. Part of the ADA are standards for accessible design in new construction and alterations to existing structures. Some recognizable features of accessible design include ramps and handicapped parking spots. Which restrooms need to be ADA compliant? All bathrooms that will be accessible to the public need to be ADA compliant. In addition to public restrooms in government buildings, this includes businesses offering public services. Restaurants, theatres, doctor’s offices, and other businesses that welcome the public into their structures need to follow accessibility standards. Commercial spaces that are not accessible to the public, like offices and warehouses, need to be ADA compliant in all new construction and modifications. There are exceptions for historic buildings and small businesses that employ fewer than 15 employees. If achieving perfect ADA compliance is financially infeasible, coding officials may choose to compromise with small business owners by suggesting smaller, more affordable accessibility improvements. How does ADA compliance impact conex restroom building design? ADA compliant restroom buildings must have an accessible bathroom stall for each gender. That means a restroom for women and a restroom for men would each need an accessible stall. Having a separate handicapped bathroom is not acceptable for new construction. Like any other accessible bathroom, container bathrooms must have the appropriate fixtures with proper placement. It’s easy enough to select and install compliant sinks, fountains, and grab bars. The biggest challenge is creating an ADA compliant layout in an eight-foot wide space. There must be ample room for a person using a wheelchair to both enter and exit the accessible stall. This means adding a certain amount of clearance between the accessible stall and other fixtures like sinks. Because containers are eight feet wide, it makes most sense to devote one end of the container to an accessible stall. How many toilets can be laid out in an ADA compliant container bathroom? Dividing 20-foot containers into two accessible bathrooms, each with its own sink and toilet, is the best way to use limited floorspace. 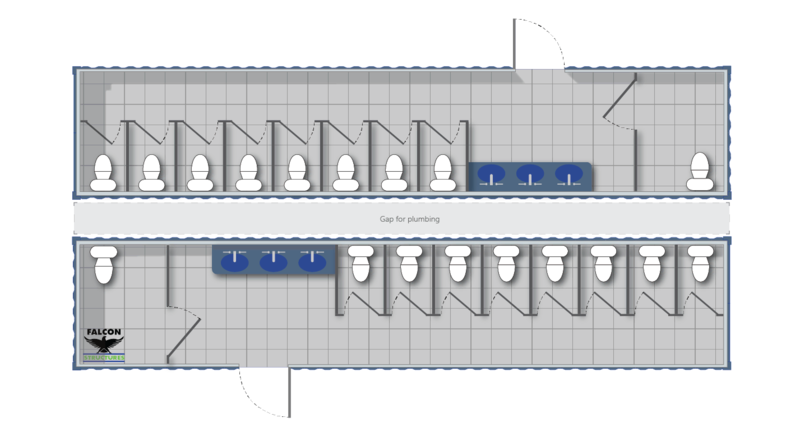 A 40-foot container could be divided into two wings, a men’s and a women’s segment, each containing one accessible stall and one narrow stall, for a total of four toilets. 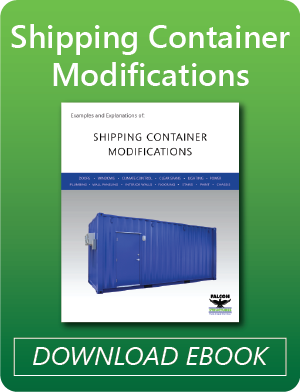 Custom sizes are possible, but cutting and merging containers will raise the final cost. You can achieve a large capacity by placing two containers side by side. Each container would accommodate one gender. For instance, two 40-foot containers could comfortably accommodate two accessible stalls and 16 narrow stalls for a total of 18 toilets. It depends. The number of toilets and sinks required depends on the nature of your business, and who will access it. For example, International Plumbing Code stipulates that a school must provide one toilet per 50 occupants, while a manufacturing facility only needs to provide one toilet for every 100 occupants. Code varies state to state on whether retailers and restaurants need to provide customers or just employees access to a toilet. What are the advantages of shipping container bathrooms? The chief advantages of container bathrooms are their speed and potential to augment existing spaces. Public parks looking for fast, free standing public bathrooms could place an ADA compliant conex restroom building in a few days, saving them the hassle of on-site construction. Conex restroom buildings also help businesses experiencing sudden growth. To accommodate more employees, a business may need to add ADA compliant bathrooms. Instead of closing the existing bathrooms for renovations, the business can quickly place their new restroom building in under-used space, like a parking lot. Blog: Porta-Potties VS Shipping Container Restroom Buildings. Solution: Mobile Locker Rooms with Showers. If you have more questions about shipping container restroom buildings, contact us at 877-704-0177 or sales@falconstructures.com.